Travel Costs > How Much Does the Golden Gate Bridge Toll Cost? How Much Does the Golden Gate Bridge Toll Cost? The Golden Gate Bridge is a suspension bridge that spans the Golden Gate, which is the opening of San Francisco Bay into the Pacific Ocean. With its simple yet powerful art-deco design, this 1.7-mile suspension span connects Marin County and San Francisco and was built to be capable of withstanding winds of over 100 miles per hour. 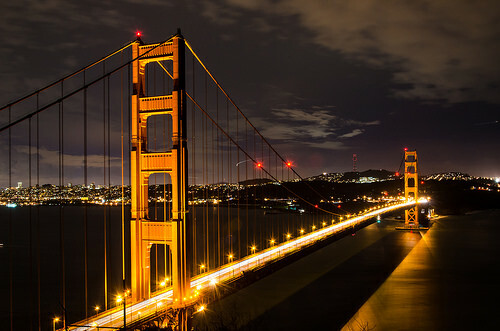 The Golden Gate Bridge has become an internationally-recognized symbol of California and San Francisco. Many people may even recognize it from the opening and closing credits of the old show Full House. How much is the San Francisco Golden Gate Bridge toll? NOTE: These prices were sourced from the official Golden Gate Bridge website, GoldenGateBridge.org. In case you have a rental car that uses the EToll, you may be charged an additional fee for more than $6 of the toll fee. If you use the rental car pay-by-plate option, you will be billed for the toll plus a processing fee of about $3 per day up to a maximum of $15 for the rental. If you fail to pay your toll invoice within 21 days, you will be issued a $25 penalty. All tolls are electronically assessed with no stopping at the Toll Plaza. At the Golden Gate Bridge, the tolls can only be assessed in the southbound direction, heading to San Francisco. There are four ways to pay tolls: the FasTrak and three pay-by-plate options that include a one-time payment, toll invoice or via a license plate account. The tolls can be paid by means of cash, check, money order, or credit card and can be paid in person, online or by phone. A toll invoice will be mailed to the registered owner of the vehicle. You can pay via the official website, even if you didn’t receive an invoice yet. The Golden Gate Bridge was the longest suspension bridge span in the world after it was completed. It still has the second longest suspension bridge main span in the US, after the New York City’s Verrazano-Narrows Bridge. As part of both California State Route 1 and US Route 101, the bridge connects San Francisco city on the northern tip of San Francisco Peninsula to the Marin County. Bike riders and Pedestrians can both access the east entrance for an excursion on one of the most famous corridors in the world. For photos, or to view the bridge in its entirety, try the spectacular lookout points located at the southeast and northeast ends. Do not miss the historic Roundhouse, a gift shop, and visitors center, which boasts a selection of souvenirs and an informative exhibit about the bridge’s construction and its history. FasTrak offers discounted toll rates as seen in the table above. If you live in the Bay Area, then this will be the cheapest way to go. There is a reduced toll rate for carpoolers on weekdays, and FasTrak is required for carpools. Vehicles eligible for the free toll passage, during designated days and hours, include vehicles with three or more people, buses, and motorcycles as designated and defined by the CA DMV. There are many bus systems in the area that continually cross back and forth over the Golden Gate Bridge. Check with these bus routes and schedules to see if there is one that you could ride to get to your destination. This will be cheaper than driving your own car and paying the toll every day. SF GGB is OVERPRICED and they need a CASH toll booth. Most outsiders and visitors do not have fastrack or even know how to pay. STUPID Board of Supervisors making asinine decisions impacting everyone.